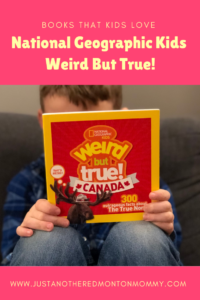 For the past couple of years, it’s been a journey for reading with Carter so when I was offered the chance to review National Geographic Kids Weird But True! books I jumped at the chance. The Weird But True! books feature many facts, stats, tidbits, and trivia about Canada and around the whole world and are the most popular department at National Geographic Kids. The books are filled with bright and clear photos of people, places, and animals with bold colors that captivated the kids from front to back. And to be honest the kids weren’t the only ones who learned a few things. For example, did you know that Beavers have orange teeth? I honestly had no clue. 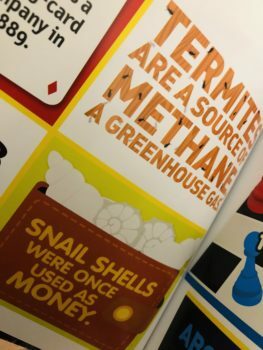 And snails, their shells were once used as currency! Also, some places use a beet juice mixture to de-ice their roads. Beet juice… that is both fascinating and messy. We’ve had these books for a couple of weeks now, and every time we read them we discover something new. Enter the Weird But True! Canada contest. Kids 6-14 years old are invited to share a fun verifiable fact about their hometown, province, or country at nategeokids.com/wbtcanada. The contest ends March 1st, 2019! I received the National Geographic Kids Weird But True! books to review from Moms Meet. Compensation for this post was received and all opinions are my own.